When I saw Josh Ritter several months ago (just after he finished recording his new album Sermon on the Rocks, which will be released on Oct. 16.) he introduced his newest ditty off the upcoming release, “Getting Ready to Get Down.” It was a crowd mover, a bubbly track much in the style of “To the Dogs or Whoever” with rapid lyric spitting and a funky bass riff mixed with a hip drum beat. Ritter recently released it to the public (July 31), and it has shot up the iTunes ranks, so much so that it appeared on the front page of Hot Tracks today. So, of course I need to share the track. 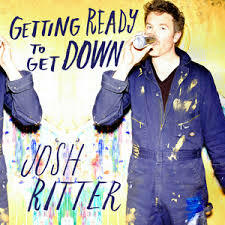 Josh Ritter is one of my favorite artists creating music today. He blends several styles of folk/rock with intelligent lyrics. It’s easy to sing-a-long to most of his songs, and he carries the title of almost universally creating highly listenable tracks. “Getting Ready to Get Down” is that type of song. I particularly enjoy the country guitar stylings featured in the middle of the song; it’s a bit different, and it may signal an intriguing dynamic on the new album. But, like always, Ritter’s most endearing quality is his lyric, and this song has a killer verse that I need to share. Talk about bible puns and satirical paradoxes. Ritter tells a message with a punch, a socially liberal sermon from his own personal mount, and I am an eager myrmidon to Ritter’s church of great music.